I’m glad I touched on the graphics on Final Fantasy VII last week, so I can move on to bigger and better aspects this week. Things more deserving of my attention right now are the oft-praised materia system, frequently overlooked depth of character interactions, and playing a more modern fantasy while still noting the many throwbacks to games of the past. Let’s start with that last one. Every game up to Final Fantasy V felt so similar thanks to their comparable settings. There are kingdoms ruled by royalty, modest towns with low populations, and fields upon fields infested with goblins, skeletons, and angry woodland creatures. Final Fantasy VI takes the first step toward modernizing the series, introducing a steam-operated society where magic is a thing of the past; nearly a myth, even. They were still fairly medieval though, with no telephones or electricity to speak of; every building was still being lit buy lamps and torches. Final Fantasy VII makes an enormous aesthetic leap to feeling closer to present day: there are televisions, walkie talkies, and even (heaven forbid) guns. Even the standard random enemies look more technologically advanced. The Bolt spells have never seen so much use, as you’re constantly pitted against man-made, electronic monstrosities, with nary a goblin or skeleton to be seen at this point. In this sense it’s not difficult to see why so many people jumped on the Final Fantasy boat for the first time with VII, as it felt much less “fantastic” and much more “action drama with monsters and swords”. Another step away from traditional Final Fantasy titles is the simple fact that you spend the first half dozen hours at least wandering around Midgar before reaching the world map. 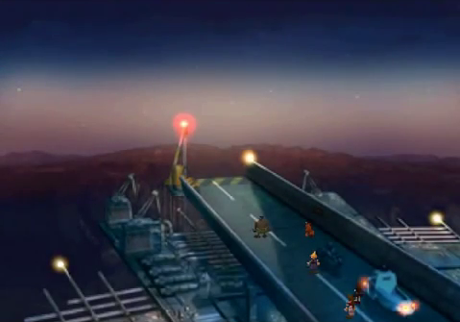 I know many people who, upon first playing the game, thought surely they’d reached the end when they left Midgar because they’d already played for close to ten hours, when in reality the real game was only just beginning. The times sure have changed from Final Fantasy, where you begin the game directly on the world map, with no direction or information. In 1997 this was truly unlike any game that had come before it, Final Fantasy or otherwise. Having said that, it still manages to maintain that classic Final Fantasy feel. You start the game with a vague understanding of political turmoil, and you’re part of a rebel group that looks to overthrow the evil and bring peace to the world. Soon you find out there’s a lot more at stake than previously imagined, and you must gather a rag-tag group of allies from all over the world to aid your cause. You travel on foot and explore everywhere you can until you find new transportation to a new part of the world. I’ve been familiar with the boat ride from Junon to Costa Del Sol for many years, but only now do I realize that this trip is just a fresh iteration of ferries that have happened in nearly every game in the series before Final Fantasy VII. Most recently I’ve obtained the Buggy, similar to Final Fantasy IV’s Hovercraft in that it allows me to look around for new paths in areas already explored, opening the world up even more. 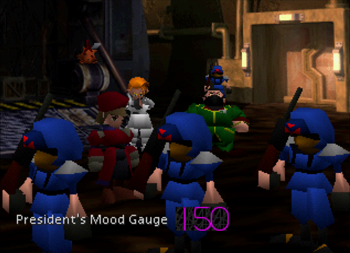 Another bit that makes Final Fantasy VII feel like a bigger world overall is the crazy amount of mini-games. I mentioned previously that FFVI really opens up and allows you access to plenty of extra side bits in the latter half of the game, but FFVII has you taking on extra quests and mission right from the beginning. There’s Cloud dropping barrels onto Aeris’ attackers in the church; squatting at the Wall Market gym to win a wig; a different puzzle on nearly every floor of the Shinra building; protecting your teammates from the back of a motorcycle as you flee the city; assisting Fort Condor residents to protect the bird from attackers; providing CPR to a little girl who’s nearly drowned; dressing up like a SOLDIER to impress President Rufus with your synchronized battle movements; racing chocobos at the Gold Saucer. All that has already happened, and I’m only halfway through the first disc of three! Some of these bits only happen once, while others are (or can be) recurring throughout the game, as others still become attractions at the Gold Saucer later on. Any way you slice it, Final Fantasy VII is chock full of fun activities, be they mandatory or bonus. It consistently keeps the gameplay fun and interesting, never feeling bland or tired. I promise I’m trying to critique this game as best I can, but so far it’s just doing a damn good job at impressing me all over again, even with my fresh perspective from past games. In fact I’m not finished praising it just yet. I’ll have more to say on this in coming write-ups, I’m sure, but I want to briefly talk about character development. 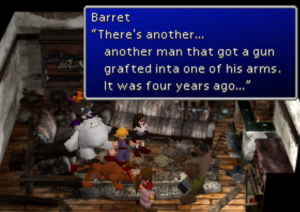 Specifically at this moment, I want to talk about Barret. He starts off as some typical, rough and tumble black dude who swears a lot – he almost comes off as a caricature. You think, “Oh, this guy’s got a gun arm because why not? I guess that’s pretty badass.” Then you meet his… daughter? Huh? Strange, Barret certainly doesn’t seem like the doting father type. You later find out, as I recently did, where Marlene came from, why she’s so important to him, and how and why he came to get a gun grafted onto his arm. It is both a necessary deviation from the main story and a welcome bit of background. Plus you come away from it with a brand new car! I like to think that Squaresoft learned from Final Fantasy VI, as they kicked the cast down from 11 (plus three optional) to 7 (plus two optional) in FFVII. The game itself is also much larger than anything prior, offering ample opportunity to touch on each character’s back story sufficiently. When I gained party members Cyan and Sabin in FFVI, different people following my marathon mentioned how they were their favorite characters. Honestly, even though Cyan’s final goodbye to his family was incredibly touching, neither character ever struck me as particularly interesting by the end of it. Anyway, I have to stop myself on this topic before I go off on a tangent I’ve already covered to death in past write-ups. I’ve got more I could say, and I know I didn’t get into the materia system of character interactions (completely different from character development), but I’m already over 1000 words here as it is. Plus I reckon I’ll always have more to say about Final Fantasy VII, so I’ll pause and save some for next week. Next stops: Gongaga and Cosmo Canyon.